Robert Brannigan, ’92 MD, ’93 ’94 ’98 GME, professor of Urology, has been appointed as assistant director of Student Affairs. As the new assistant director of Student Affairs, Robert Brannigan, ’92 MD, ’93 ’94 ’98 GME, professor of Urology, will work closely with Sandra Sanguino, ’93 MD, ’96 ’99 GME, MPH, associate dean for Student Affairs, to address the unique issues medical students face and help with career planning. He will also collaborate with education leadership to implement effective wellness programs. 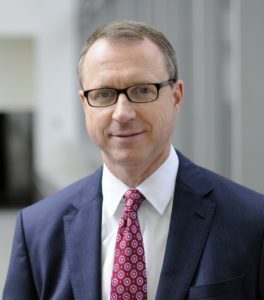 Brannigan is a Feinberg alumnus: He received his medical degree here in 1992 before completing his internship in general surgery and residency at Northwestern Memorial Hospital and McGaw Medical Center. As a faculty member, he has served as a mentor and resource to students not only in Urology, but also across the medical school. What are your responsibilities in this new role? First, I would like to thank Diane Wayne, ’91 MD, Marianne Green, MD, and Sandy Sanguino, MD, for the opportunity to join the AWOME team. I have thoroughly enjoyed all of my prior work with the AWOME group, and it is clear that Feinberg is leading the way nationally in medical education. This is a group of highly talented individuals who are truly dedicated to the students, and I am honored to now have the chance to work with them more formally. We want to help our students emerge from Feinberg optimally positioned to match in the residency training programs or other career destinations of their choice. In this new role I will work closely with Dr. Sanguino and the Augusta Webster, MD, Office of Medical Education staff to address all of the issues that students face during their undergraduate medical education. A lot of my focus will be on active mentoring and career planning. We want to help our students emerge from Feinberg optimally positioned to match in the residency training programs or other career destinations of their choice. Wellness is also a very important issue in the medical education environment right now, and there is a large focus on this area within Feinberg. Dr. Wayne and Dr. Green have made this a priority at Feinberg, and Dr. Sanguino and Allison Matricaria have already implemented very innovative programs to further the cause. I look forward to helping the leadership further develop and introduce effective student wellness programs. Finally, student mentorship and career advising are among the most rewarding aspects of our daily work. A lot of our students desire graduate medical training within competitive residency training programs, and it’s our job to help them position themselves to secure these spots. I’ve done a lot of this sort of work over the years within the Department of Urology, not only for students going into urology, but also for many students choosing other fields of study. I look forward to bringing some of the things I’ve learned along the way to the medical school more broadly. What are some of those things you’ve learned? First, I think it’s important for students to expose themselves to as many different areas of medicine as possible. We should encourage our students to learn about themselves and actively determine where their interests and talents lie. It’s also important for students to consider getting involved in research at an early point in their careers. Participation in clinical or basic science research is incredibly educational and exposes students to a different aspect of the field they are considering. The process of developing an idea, engaging in research and seeing that through to the ultimate publication of a manuscript is one of the most gratifying experiences a student can have based on our students’ feedback. Participation in scientific investigation and writing also helps students distinguish themselves as they apply for graduate medical education positions. It’s important for students to be reassured that not everyone has a clear career pathway in mind. Part of my role will be to help these students identify where their true clinical interests lie. This is an active process that can involve helping students shadow clinicians within different specialties of medicine or facilitating research opportunities within a given potential area of interest for them. How does being an alumnus fit in this role? I love Northwestern. I’m extremely grateful that I had the opportunity to do my training here. Although the times have changed a lot since I was a student, I’ll never forget what being a student was like, and I will never forget the people who helped me along the way in my career. The Department of Urology has a rich tradition of outstanding student education and exceptional student mentorship going back decades, and I am one of the people who benefited from that culture. This is a large part of the reason why I have a special interest in medical student education and for me this opportunity to more formally join the team at AWOME is a dream come true. Why should everyone know about student wellness? The issue of wellness applies to all human beings, and physicians are not immune to the stresses and strains of life in 2016. The role of the physician in society is more important than ever. That being said, the training involved in becoming a physician and the day-to-day work of a physician is challenging, to say the least. We need to make sure that physicians are taking care of themselves adequately. Only through this approach will physicians be able to give their very best to their patients. The issue of wellness applies to all human beings, and physicians are not immune to the stresses and strains of life in 2016. I’m looking forward to participating in Feinberg’s existing student wellness programs and helping to develop even more. Medicine is a career of continuous learning, and part of that learning applies to wellness. Medical schools across the country are now realizing the importance of training medical students more formally in how to take care of themselves. These are life skills that we hope all students emerge from Feinberg knowledgeable in and committed to maintaining over their professional and personal lifespan.